A study by PsychTests.com indicates that people who believe that they are not worthy of love and respect are more likely to struggle with major self-esteem, relationship, emotional, and behavioral issues. “I don’t deserve love” is one of the most damaging beliefs we can adopt. Believing that we deserve love begins with one crucial factor: A healthy degree of self-love and a strong sense of self-worth. They are three seemingly simplistic words: “I deserve love.” Yet there are people who can’t bring themselves to believe those words, let alone say them, and this in itself speaks volumes about their character. Those who believe they are unworthy of love are not being modest, stoic, or poetic; they are denying themselves a fundamental need that all humans crave. Moreover, according to research from PsychTests the belief that one is undeserving of love can have a significantly negative impact on a person’s well-being. 68% of people who believe they are unworthy of love also admit they don’t like themselves (compared to 6% of people who believe they deserve love). 62% also think they are boring and uninteresting (compared to 14% of people who believe they deserve love). 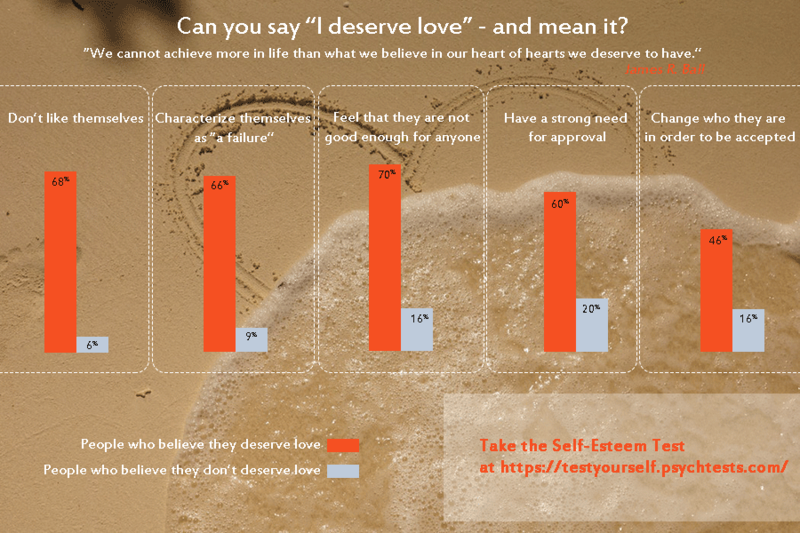 70% feel they are not good enough for anyone (compared to 16% of people who believe they deserve love). 46% will change their personality, opinions, or appearance in order to be accepted by others (compared to 16% of people who believe they deserve love). 42% have an intense desire to be liked by everyone (compared to 28% of people who believe they deserve love). 60% have a strong need for approval (compared to 20% of people who believe they deserve love). 54% give more weight to other people’s opinion of them than their own personal opinion (compared to 10% of people who believe they deserve love). 57% also believe only attractive and/or successful people deserve respect (compared to 22% of people who believe they deserve love). Along the same vein, 62% of people who believe they don’t deserve love prefer to associate exclusively with people who are successful and/or popular (compared to 24% of people who believe they deserve love). 66% characterize themselves as a “failure” (compared to 9% of people who believe they deserve love). 66% believe they are “worthless and useless” (compared to 10% of people who believe they deserve love). 64% believe they will never achieve anything significant or become anyone important (compared to 8% of people who believe they deserve love). 48% are devastated when someone criticizes them (compared to 12% of people who believe they deserve love). 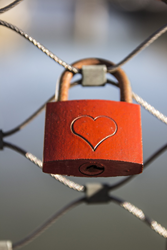 48% are extreme perfectionists (compared to 13% of people who believe they deserve love). 60% have a strong fear of rejection (compared to 24% of people who believe they deserve love). 37% will not admit when they have made a mistake (compared to 9% of people who believe they deserve love). 54% avoid conflict for fear of upsetting others (compared to 28% of people who believe they deserve love). 51% frequently seek reassurance from others before making decisions (compared to 38% of people who believe they deserve love). 32% constantly ask for validation from their loved ones (compared to 19% of people who believe they deserve love). Do you believe you are worthy of love? Here’s why this conviction is so important.People who believe that they deserve love have a very different approach to life than those who believe they don’t deserve it.